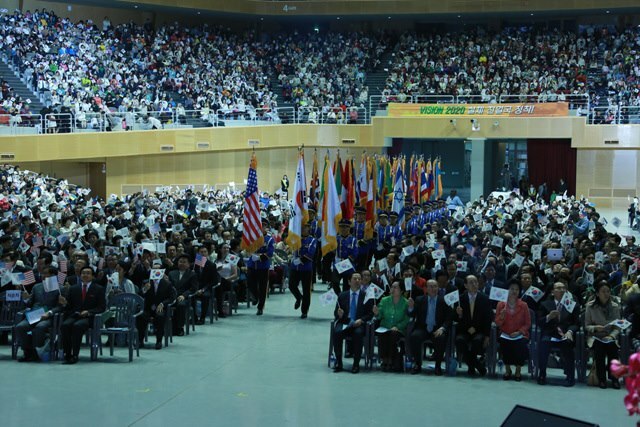 The “Joint Worship Service for Victory of Vision 2020” was held at the Cheongshim Peace World Center from 10:30 AM, Sunday, on 3.26 by the heavenly calendar in the 1st year of Cheon Il Guk (May 5, 2013). The stadium was filled with more than 15,000 people. The master of ceremonies for this day was Dr. Dong Woo Kim, regional president of Oceania. The service was broadcast live through the internet. 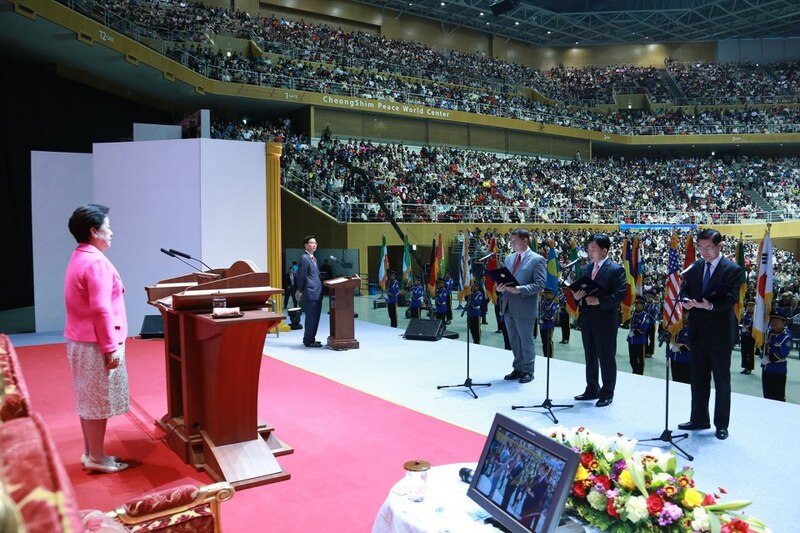 Before the start of the main ceremony, a video from the Foundation Day events was shown and a choir group consisting of CARP students in Korea prepared the atmosphere of the service with their passionate performance. Many blessed families were taking part in the 2013 Purification Azalea Festival that was being held at the Cheongpyeong Heaven and Earth Training Center during this time. May 5 also happens to be Children’s Day in Korea which helped create a familial atmosphere for the worship that day. 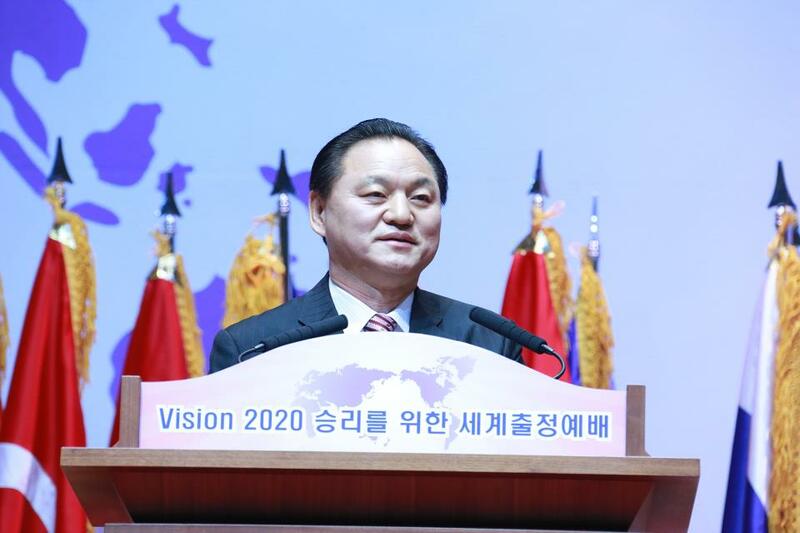 In his address, Dr. Chang Shik Yang, the International Executive Vice-President, presented the direction and strategy for victoriously fulfilling Vision 2020 and shared some of the activities that were being carried out in Korea and abroad for this purpose. Dr. Yang outlined three pathways for achieving Vision 2020—system-oriented leadership, member-centric churches, and fulfilling our missions as new tribal messiahs. 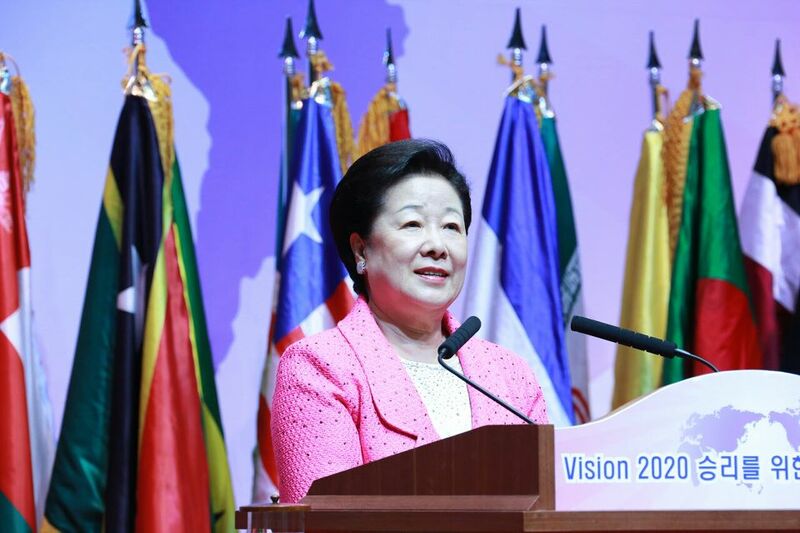 He also introduced the action steps that were being taken in Korea and briefly presented some of the activities being carried out by the regional presidents, Cheon Il Guk special envoys, and national leaders of the 43 strategic and providential nations. He reminded us of how True Father emphasized the mission of tribal messiahs in the last prayer that he gave on earth, and encouraged all of us to commit ourselves completely with life-or-death resolution to substantiating Cheon Il Guk and offering the Heavenly Parent a homeland by 2020 that can serve as the hometown of all seven billion people on earth. A video summarizing many of True Mother’s recent guidance was presented. After this video, True Mother came to the stage. She began by asking the members what kind of dream they had. True Mother also asked that all the blessed families and the blessed children of the world carry on the True Parents’ tradition of absolute faith in fulfilling their mission as tribal messiahs and expand the scope of our responsibilities beyond the tribe to the society, nation and world, so that all humankind can become citizens of Cheon Il Guk. Forty-three students from the Universal Peace Academy entered the stadium holding the flag of the 43 strategic and providential nations. Rev. Kyung Seok Yoo, vice-president of the church in Korea, Rev. Eiji Tokuno, president of the church in Japan and Dr. Michael Balcomb, president of the church in the United States came up to pledge their determination in front of the True Family on behalf of all the blessed families in the world. Upon the victorious foundation of True Parents, who have perfected, completed, and concluded the entire providence of restoration, blessed families around the world make the following resolutions for the victory of Vision 2020 in order to establish the substantial Cheon Il Guk. 1. Our family is resolved to let the entire world know about the great accomplishments of True Parents, who have manifested on earth as the savior of humanity, messiah, and the Lord at His second coming and have victoriously accomplished their mission. We will work toward establishing the substantial Cheon Il Guk in every country centered on the providential nations and strategic nations by 2020. 2. Our family is resolved to advance without rest until every single person on Earth is restored to the position of a Cheon Il Guk citizen in response to the providence of True Parents, who have embraced the 7 billion people of the world through true love while conducting the providence of salvation. 3. Our family is resolved to establish the tradition of hoondokae within our families in accordance with True Parents' instructions, to fulfill our missions as tribal messiahs through this hoondok tradition, and to realize the ideal world of one family under our Heavenly Parent at all costs. 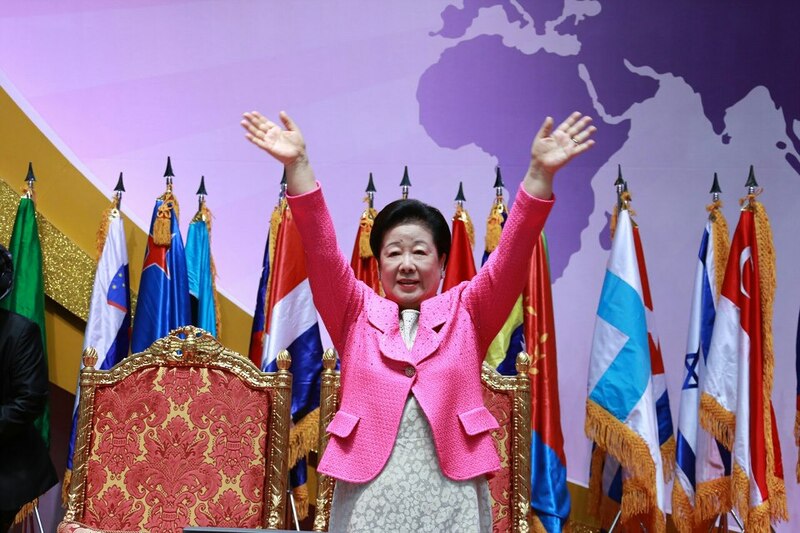 After the resolution, True Mother proclaimed and announced the start of the seven year course for substantiating Cheon Il Guk in the 43 strategic and providential nations and beyond. The worship service ended with three cheers of eog-mansei led by Dr. Yong Cheon Song, the chairman of the Unification movement in Japan.